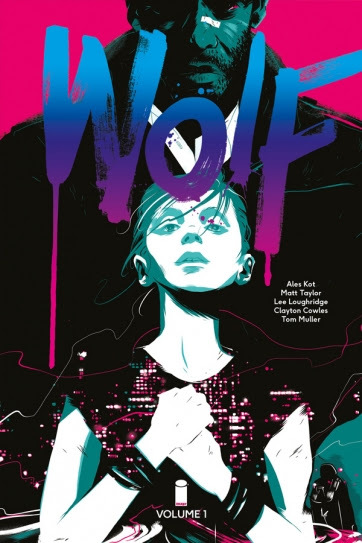 Bestselling writer Ales Kot (ZERO, MATERIAL) and artist Matt Taylor team up the fantasy, crime-noir, WOLF, VOL. 1. This collects issues #1-4 into trade paperback and will be available in November. WOLF incorporates the crime noir thrills and character development of True Detective with the mythical stakes of Neil Gaiman’s Sandman in this original fantasy, horror saga. Set in Los Angeles, California: Antoine Wolfe, a hard-boiled paranormal detective with a death wish, has to cope with sudden responsibility for an orphaned teenage girl who might be the key to the impending apocalypse. The road to hell and back begins. WOLF, VOL. 1 (ISBN: 978-1-63215-502-3) hits comic book stores on November 11th and bookstores on Tuesday, November 24th, and will be available for $9.99. It can be ordered by retailers from Diamond Book Distributors with Diamond Code SEP150551. It can be pre-ordered now on Amazon, Barnes & Noble, and IndieBound.